If you were to choose a route through which to move toxic, highly corrosive, sludgy crude oil, would you place it on the same narrow corridor used by one of the world's most endangered birds? The Canadian energy company TransCanada did and the Obama administration is on the verge of approving that absurd proposal. If approved by the administration, the Keystone XL tar-sands pipeline will move a half million+ barrels daily of Canadian crude 1,700 miles from Alberta, Canada to the Texas coast as soon as 2013. TransCanada would like the world to believe that their pipeline is relatively safe, claiming just one predicted spill in the first 7 years. Yet, TransCanada's existing Keystone Pipeline has experienced 12 spills -- in just 12 months of operation. Despite assurances by pipeline operators, spills continue. The July spill of a much smaller pipeline under the Yellowstone River in Montana released 1,000 gallons of oil into the Yellowstone. The Keystone XL would be 3 times as large, carrying 600,000 of oil per day. There have been five major pipeline spills in the United States in the last 24 months. Adding nearly 2,000 miles of high-pressure pipeline carrying one of the most corrosive and dirty fuels known to man is a disaster in the making. That doesn't sound safe, particularly not for the one of the most highly endangered birds in the world -- the Whooping crane. The U.S. Fish & Wildlife Service (USFWS) calls the Whooping crane one of the most famous symbols of America's dedication to saving its wild national heritage. Unfortunately for the crane, however, it uses the same 1,700-mile route as the proposed Keystone XL Pipeline. 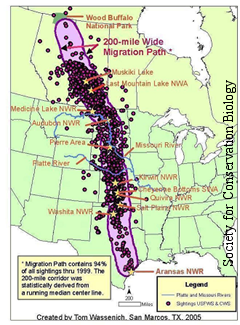 Whooping cranes follow the proposed path of the pipeline annually each spring, as they migrate from Texas to their breeding grounds in Canada. Along the way, they depend on the rivers, marshes, wetlands and streams for stopover and feeding habitat. Since the pipeline's proposed route crosses many of these habitats -- including the Platte River in Nebraska, one of the most important feeding and resting locations -- miles of these critical stopping points would be at risk of being fouled with sludgy, toxic tar-sands oil every day of the year. Scientists are deeply concerned about the potential harm to Whooping Cranes. The Society for Conservation Biology -- the world's largest international conservation science society -- has recently released a press release sounding the alarm about the cranes. For instance, a recent report found that a major spill on the Platte River could result in 5.9 million gallons of toxic, corrosive tar-sands oil being dumped into the Platte. A worst-case scenario per their research would result in nearly 8 million gallons of oil being spilled. A catastrophe of this magnitude would almost certainly decimate wildlife and potentially all that remains of this population of whooping cranes -- just 74 breeding pairs. Deepwater Horizon mercilessly demonstrated the near impossible task of cleaning oil from a marsh or wetland. And this oil -- tar-sands oil -- is much more corrosive, toxic and difficult to clean up. Once coated with sticky oil, the birds would be unable to insulate and regulate their temperatures and could slowly die from hypothermia or acute toxicity. Imagine the brown pelicans in the Gulf but with much thicker oil (and much more endangered birds). In addition to the grave risk of catastrophic spill, whooping cranes would be put at still further risk by the installation of aerial power lines that would be constructed to power pumping stations on the proposed pipeline route. Collisions with power lines are already the largest known cause of death for migrating Whooping cranes. This proposal would result in hundreds more miles of aerial lines throughout the birds' migrating path, compounding the likelihood of disaster. These aerial lines won't be built without the pipeline and the pipeline won't be built without them. This pipeline simply cannot be built without putting the whooping crane and as many as 10 other endangered species at great and unnecessary peril. Despite that, the State department recently published its Final Environmental Impact Statement (FEIS) asserting that there would be no significant impacts along the proposed corridor. Alarmingly, the State Department declined to include any analysis from the soon to be completed USFWS biological opinion regarding the Keystone XL Pipeline. In doing so, the State Department has completely ignored the impacts of the proposed pipeline on the highly endangered Whooping crane and in so doing, ignored the requirements of the Endangered Species Act. The Obama administration could announce its decision whether to block this remarkably flawed proposal at any time. The White House needs to hear from you. 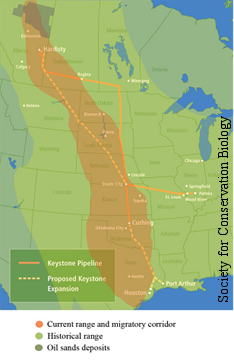 Please go to www.stopextinction.org to tell the President to block the Keystone XL Pipeline.